There is a problem that we have done here. it is called Theodicy. Theodicy is the study of evil and why it exists. Conversations on this can range from issues of free will (you have a choice), to double predeterminism (the saved have been chosen by God for glory, while the lost have been chosen by God for destruction, and there is nothing anyone can do to change this), to karma (you are experiencing in this life the evil you have done in the last life). Psa 51:5 "Behold, I was shapen in iniquity; and in sin did my mother conceive me", that is to say that even the environment in which I was conceived (womb and socio-geographical location) and born through (womb) and into (socio-geographical) is sin-infected. Our who, what, where, and how are all designated in the Bible as sin. Sin is transgression of the law, and evil is the state of being one lives in and becomes after sinning. The two are practically synonymous. If sin is so big, and evil so existential, if we would understand evil, we must look to the source of sin for the human family. Everyone knows the story of Eve, the Snake, and the Fruit. I will not retell the entire thing here. I wan to focus on one verse in that narrative, which I think will reveal something of sin and evil, if we take our time with it. Compare with me the command of God verses the lie of the serpent. Gen 2:16-17 And the LORD God commanded the man, saying, Of every tree of the garden thou mayest freely eat: But of the tree of the knowledge of good and evil, thou shalt not eat of it: for in the day that thou eatest thereof thou shalt surely die. Gen 3:4-5 And the serpent said unto the woman, Ye shall not surely die: For God doth know that in the day ye eat thereof, then your eyes shall be opened, and ye shall be as gods, knowing good and evil. God has stated that if we eat of the tree, we would dying die (a translational equivalence). This phrase "you will dying die", is God telling us that if we disobey him, just as there was a process in our creation, that proces will work in reverse, our compentents will separate from each other, "...the dust return to the earth as it was: and the spirit shall return unto God who gave it" (Ecco 12:7). The Serpent states something different. He says, "you will not dying die. For God knows that when you eat of it, your eyes will be opened, and you will be as God knowing good and evil." What is evil? Question: where did all of creation, according to the Bible, have its origins? God. Where did all of creation draw it's life from? God. Who designated the creation and life as good? God. How can God do this? Because life and goodness originate from within God himself. Mar 10:18 And Jesus said unto him, Why callest thou me good? thereis none good but one, that is, God. If God is good and God is life, then to know God is to know goodness and life. So then, if I disobey God, if I rebel, I choosing against goodness and against life. Since living, existence, is dependent upon life, and life is dependent upon God, then to chose against God it to chose death over existance. Thus God can say, "if you eat of this tree, you will dying die (paraphrase)". That is to say, "If you disobey me, you will decreate and cease to exists". There was nothing wrong in with the tree. Genesis 2:9 states that every tree God made was fit for food and lovely to see, and this is precisely what Eve saw when she looked at the tree in Genesis 3:6. The issue was one of knowledge through experience, not evil in the tree. God had said don't eat it, told humanity the consequences, and told them nothing more. God had designed us to know life, goodness, and Himself. Outside of him there was nothing to know, and no way to know it. A representation of the lie, which humanity has believed for millennia. "You will not dying die. Rather, you will be like God, knowing good and evil." This is the serpent's promise. Look at it carefully. He is promising them a death, just not a finality in death. In death he offers them life. He says you will be like God, knowing good and evil. Well, if God is life and good, then the serpent promised us we would know God, and not-God. That is to say, we would know life from God, and evil. However, this knowing of evil in concert with his "you will not dying die" gives us his ultimate promise. Self-existance. God has used a process of building up humanity: breath of life plus dust of ground equals living soul. The serpent acknowledges that they will experience a dying, a separation of the components God had placed together, and of life derived from God, but they will continue on. He is promising them 1) that the breath of Life can leave the dust of the ground and they can still exists, or 2) that they need neither dust of ground (God-made), not breath of life (God-breathed), to be a living soul. He has offered them soulishness part from body from God and breath from God. To know God is to live according to God's life, design, and rules. To know evil it is to allegedly live life derived solely from the self, one's own design, and one's own rules. The serpent promised them self-existance. However, instead of a holistic life given as God design (breath + body = living soul) the serpent offers a fractured, partial, and dualist existance (breath - body = ?). He promise was empty. Recap: God is life and goodness. God said that disobedience would result in the un-creation, humanity, back into non-existance. The serpent promised an existance after the un-creation process, an self-generating, a life principle, welling up from within humanity causing us to exist autonomously, but not holistically. 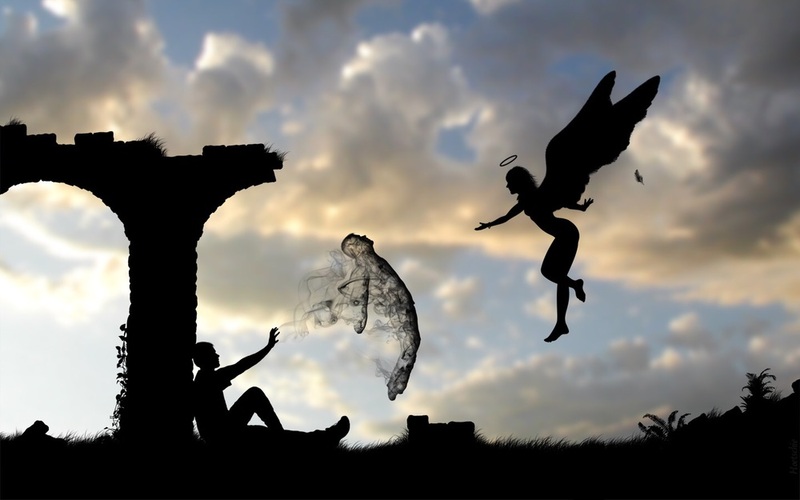 When Adam and Eve sinned, they should have immediately begun the dying process, resulting in their final non-existance. They should not have had time to live and make more mistakes. Just as God created from nothing, formed them from dust, and breathe into them (it didn't take a long time), so the same process should have immediately begun in reverse, and that quickly. What happened? Why do we exists? If they should have been dead literally within one day maximum. They answer can be seen in god's response to humanity's sin: God came searching. when we sinned, we pulled back from God, turned our backs to him, wanting to exist unto and of ourselves. God loved us too much to let us die without a fight. He came searching. He came calling. He came walking. The Bubble of Grace, giving humanity a second chance. He came with promises for our good. It is this first promise that ensures our existance. It is the promise God made to the snake. It was the promise of the Seed to come and kill "the serpent". This promise of death to the serpent brought a 2nd chance to humanity. Immediately humanity was encapusalted in a spiritual existential bubble called grace, which allows us to exist while still sinning. We have been given time to choose again. The Old Testament reveals the presence of the Spirit of God, moving in the hearts of people, and Romans 1 reveals that God was known through oberservation and interaction with nature. Both were granted on "credit", that those who woud choose to follow the Spirit would not have to pay sins wages, becasue Jesus was coming to pay it. Our entire existance is now, until Jesus returns, "in sin...in iniquity", with the possibility OT choosing God. We are able to live lives of sin, as sinners, based on the grace of God in not allowing the human race to immediately go into extinction at the fall, "...not willing that any should perish, but that all should come to repentence". Representative of the Universe as Chaos (L) verses the Universe as Creation (R)...if the serpents promise were true. If there was an existance, in which sin could exist, it could not create anything. Consider this: all things creative come from God, as he is the original source of creative imagination and authenticity with power. Sin is a response to the creator, a rebellion against his will and person. Thus, sin is in all actuality a non-thing. It exists as a choice of the will in opposing God, which, outside of grace, would result in immediate death due to stepping out of Life who is God. If sin was an actual thing, it would have to be the opposite of everything which is God: destructive not creative or productive, unstable not stable, transient/temporal not permanent, incorporeal/immaterial/non-substantive not substantive, chaotic not orderly, ugly not beautiful, greedy not selfless, ignorant not intelligent nor omniscient, impotent not potent nor omnipotent, no where not anywhere nor omnipresent...evil not good. If the Biblical mean or ground zero prior to creation is the dark, watery formless void then God creating would an explosive creative expansion of all that is good,beautiful, and holy moving upward from this "ground zero". If we could actually live a life apart from God, as opposed to and opposite of everything God is, it would be a expanse downward from ground zero into the negative (-). 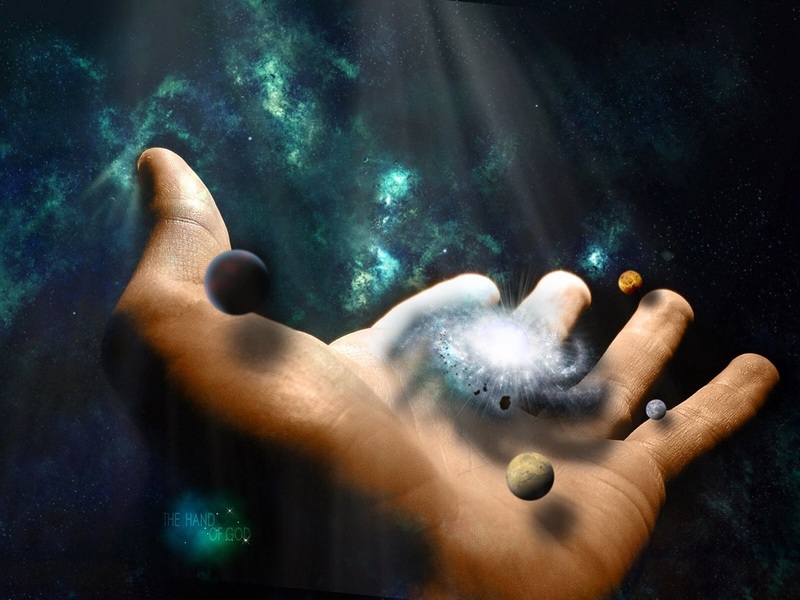 If sin/evil were an actual thing outside of our grace bubble, the hand on the right is what we offer the universe. Our existance on this planet proves the truth of this. No matter what good we create, we create it from the original intention of God for humanity. Even with our fallen frames and minds, the mark of the creator appears on all that is intended good. However, our fallen nature reveals sins mark and rule: cruel, rude, violent, selfish, ignorant, anarchic, vain, destructive. If sin, and humanity, were allowed to go unchecked in the universe, with human capacity allowed to reach the furthest reaches of the known universe, humanity's influence and presence would corrupt and destroy everything, since that is what sin, through sinners, can only accomplish. Everything would be immediately thrown back into the void from when it was liberated, as man retured to dust. So much for the what of sin. "For dust you are, and to dust you shall return."